This glamorous Bat Mitzvah invitation is printed on Bright White Linen card stock layered over Pink Punch Sparkle stock and a bottom layer of Smooth Black stock. 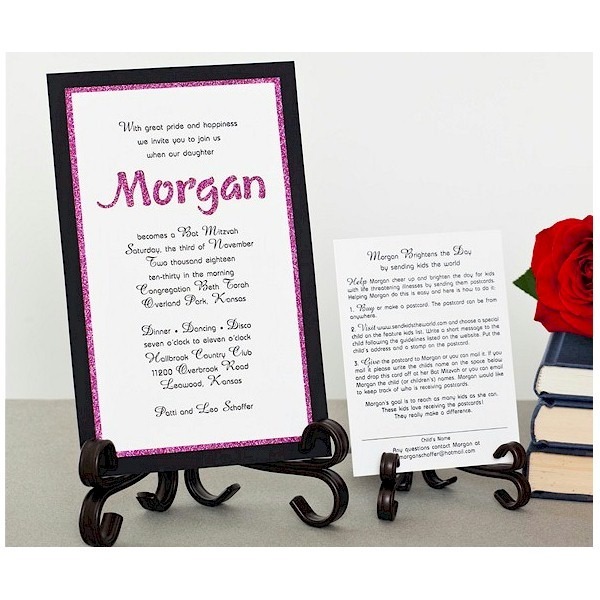 The Bat Mitzvah’s name is Laser die-cut on the top layer to reveal the color and sparkle below. This glamorous Bat Mitzvah invitation is printed on Bright White Linen card stock layered over Pink Punch Sparkle stock and a bottom layer of Smooth Black stock. 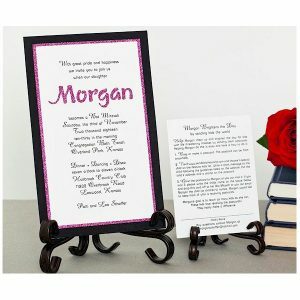 The Bat Mitzvah’s name is Laser die-cut on the top layer to reveal the color and sparkle below. (Additional “sparkle” colors available are: purple, rose, and silver). Measures 5-3/4″ wide by 9″ high. Shown with Black ink and Lettering Styles Bauhaus with Amazone initials (body copy) and Calligraphy (name). 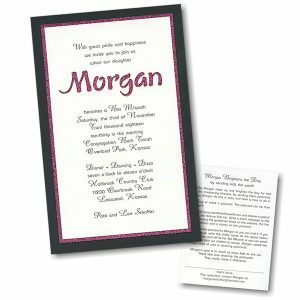 The Reception cards will print on Bright White Linen, the Response cards will print on Bright White Linen layered over the Pink Punch Sparkle, and the Informal notes will print on folding Bright White Linen stock. This Bat Mitzvah invitation is accompanied by single Bright White Linen envelopes. This invitation requires 3 weeks for production time due to the laser die-cut name. This invitation may require additional postage. Please check with your local Post Office for details.